A durable cardstock presentation folder (approx. 5 ¾" square) with Velcro closure unfolds to a width of about 14". 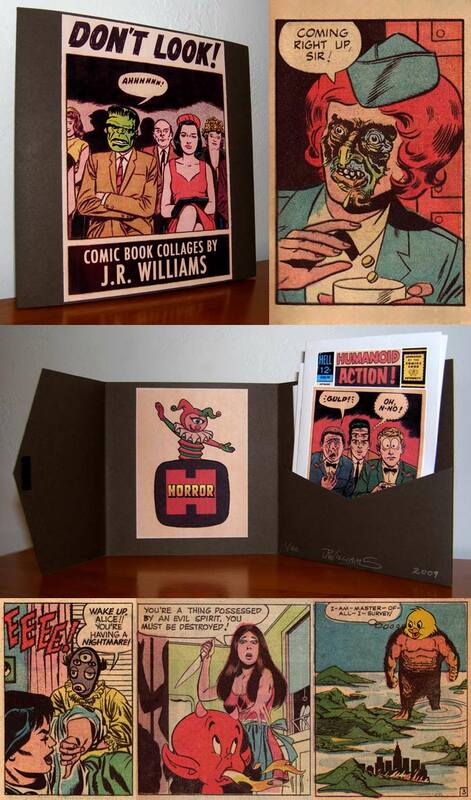 Nestled within an interior pocket are five mini-comic-sized booklets (8 pages each) featuring full-color reproductions of my comic book collage works (40 different collages, in total). Hand-assembled, signed & numbered by yours, truly. Exterior label printed on glossy Kodak photo paper. Limited edition of 25 copies. Price includes (domestic) shipping. I accept PayPal.